Though the KHL has the Czech and Croatian clubs playing, but in the territory of Russia itself, there are still plenty of gaps for hockey. Following the NHL’s example, the Russian league has embarked on a course towards new regions. This year the "Admiral" club was created in Vladivostok, and after the Olympic Games in Sochi, the "Delphin" club will appear. Read about the things to see in the Games capital as well as in the other hockey cities. Yaroslavl is the capital of the Golden Ring (this is the name for a pool of ancient Russian cities on the Volga river, which attracts many tourists). In the center of Yaroslavl, there is a local Kremlin, which is over 400 years older than the Moscow one. The view of the ancient city with many churches on the high bank of the Volga river reminds you of the classics Ostrovsky and Chekhov's lives in the Russian 19th century outback. As for hockey, Yaroslavl brings back said memories about the entire local team "Lokomotiv" dying in a plane crash in 2011. After that, the "Locomotive" was practically re-created and a year later returned to the KHL. This is the league’s most eastern point. The flight from Moscow to Vladivostok, located on the shore of the Sea of Japan, takes almost 9 hours. The creation of the hockey team there is the work of the former NHL stars. Vyacheslav Fetisov, while holding the post of senator from Primorsky Krai (whose capital is Vladivostok) lobbied for this decision, and Alexander Mogilny (whose origins are from the nearby Khabarovsk) became the club’s president. 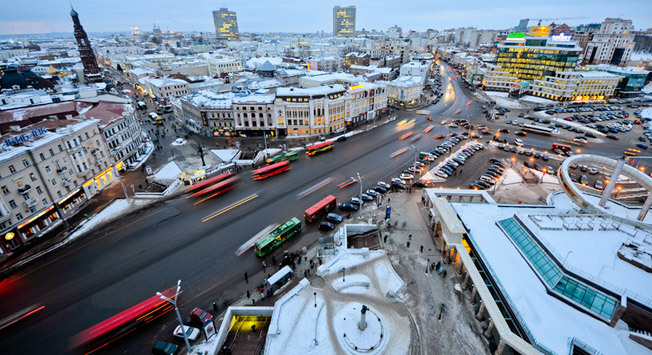 Vladivostok offers seafood, such as salmon roe and king crab, as well as cheap goods from Japan. The subject hockey club has been discussed in the southern capital of Russia since Sochi won the bid for the Winter Olympics. At one time, they wanted to transfer the Moscow "Spartak" there or some other team already existing, as it was customary in the NHL. However, now there is a decision made by the high political administration to create the club from scratch. There is a name already – "Delphin", and the general manager is the well-known Pavel Bure. The team will perform in the 12 thousand "Bolshoi" arena, where the Olympic hockey tournament final will be held on February 23. One of the most unusual cities in Russia, where the Muslim and Christian cultures are closely intertwined. Its main attractions are the "Kul-Sharif" Mosque and the Orthodox Cathedral of the Annunciation, which stand side by side in the magnificent Kazan Kremlin. The singer Feodor Chaliapin, and Gala, Salvador Dali’s muse were born here and the revolution leader Vladimir Lenin studied here. The Kazan "Ak Bars" is one of the strongest clubs in the KHL, which in recent years became champions twice. Many experts say that it is in the likeness of "Ak Bars" that the coach Zinetula Bilyaletdinov who previously worked in Kazan sculpts the Russian national team. Unlike Slava Bykov he will try to beat the Americans and the Canadians through strict playing defense. In 2013, the city became world famous due to the fall of the meteorite and the locals’ immovable reaction to this natural phenomenon. The severity of the Chelyabinsk residents has become a popular meme in Russia. The city has many industries, including the production of agricultural machinery. That is why the local team is called "Tractor”, whose main star Yevgeny Kuznetsov was drafted by the “Washington.” Last year they still had Valery Nichushkin, but he left for the "Dallas" where he will possibly be the best NHL newcomer this season. If you find yourself in Chelyabinsk, be sure to take a trip to Arkaim. This ancient settlement is called the Russian Stonehenge and the birthplace of Zoroaster.